When you choose to respond with faith again, and again, and again, you develop strong faith muscles that help to chase away doubt. 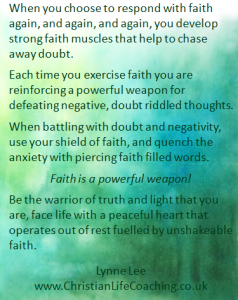 Each time you exercise faith you are reinforcing a powerful weapon for defeating negative, doubt riddled thoughts. When battling with doubt and negativity, use your shield of faith, and quench the anxiety with piercing faith filled words. Faith is a powerful weapon! Be the warrior of truth and light that you are, face life with a peaceful heart that operates out of rest fuelled by unshakeable faith.